This vinyl pool has 18’x36′ concrete walls with 16′ wide shallow end stairs. The pool’s interior has a standing ledge and two walk out benches in the deep end. The pool depth is 36″ to 5 1/2’ and the bottom of the pool was made with vermiculite base. 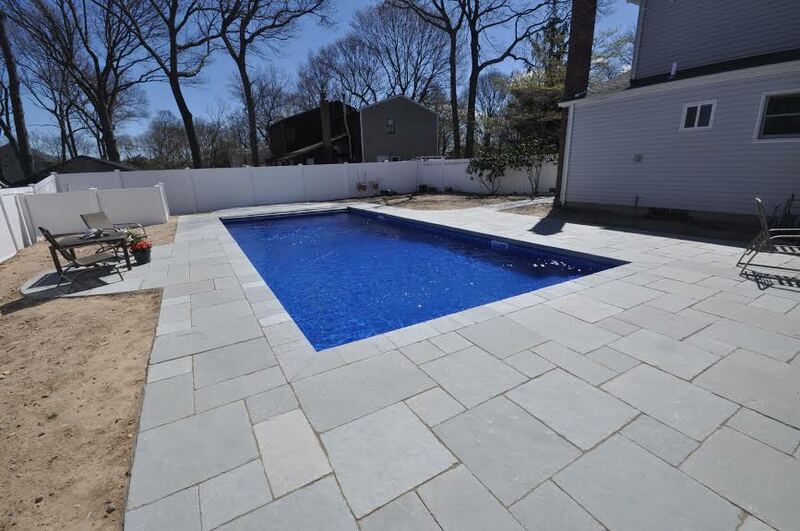 The pool is equipped with a medium gray toned auto cover to maintain the cleanliness and warmth of the pool. The coping and patio is Pompeii Roman pattern limestone, selected from the Gappsi stone collection. Design by Giuseppe Abbrancati and project installation by Gappsi.